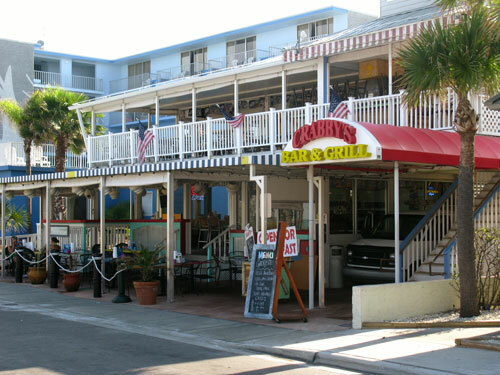 We had breakfast at Crabby's, on Clearwater Beach FL, this morning. 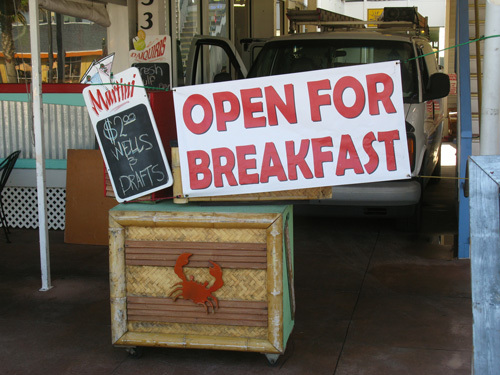 We'd been to Crabbys Bar and Grill for dinner, but breakfast is something they just started. It was a beautiful Florida beach spring morning. Cool, sunny, and low humidity. 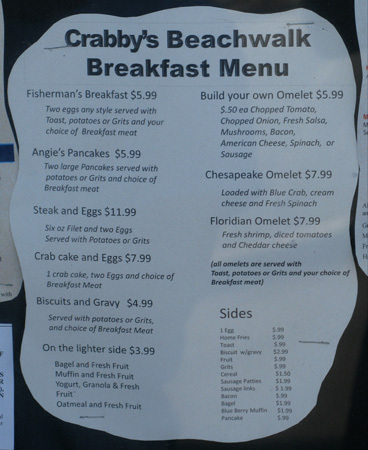 We'd seen a sign for Crabby's breakfast when we'd eaten at the Beach Shanty Cafe a week ago and knew we had to try it out. 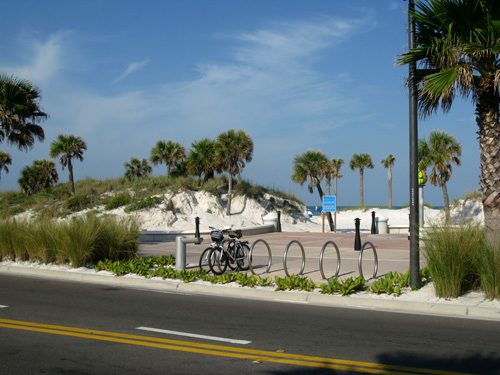 Living the Florida beach lifestyle means taking advantage of these relaxing spring mornings, so my girlfriend and I threw our bikes in the truck and headed out to the parking lot at the west end of Clearwater Memorial Highway Bridge (just follow FL 60). We could not have asked for a prettier morning. The sun had only been up for awhile and our tires barely made a sound on the blacktop of Ream Wilson Trail Bike Path. 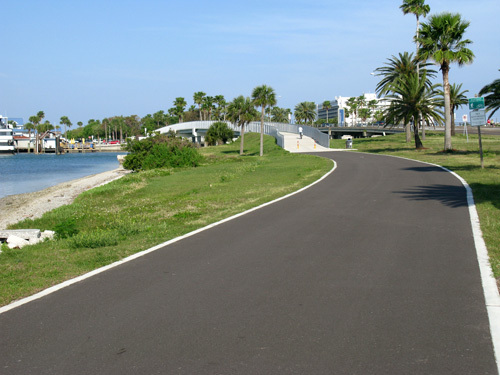 We headed west on the Ream Wilson Trail Bike Path located on the south side of FL 60, the Clearwater Memorial Highway. The parking lot is right at the foot of the west end of the Memorial Highway Bridge, but you have to drive farther west about a quarter of a mile, and make a U-turn back. 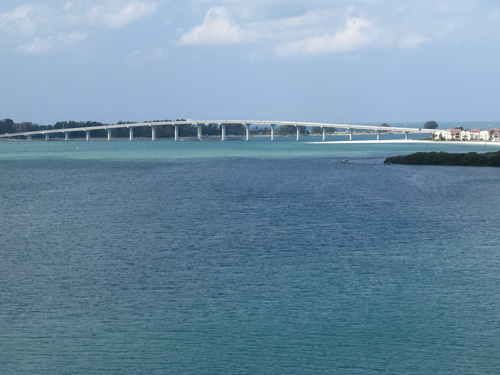 We could easily see the coral-colored Clearwater Beach Hyatt Regency Resort across Clearwater Bay, south of Clearwater Municipal Marina. That would be our target. 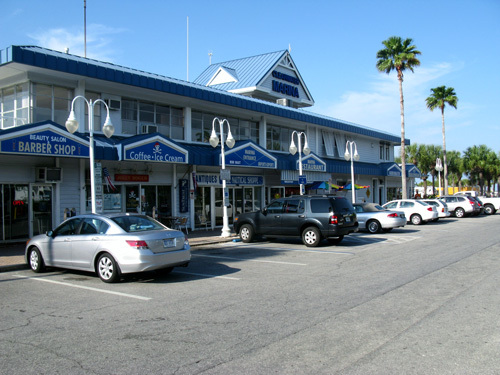 Crabby's Bar and Grill is about 200 yards south of the Hyatt Regency on Gulfview Blvd. 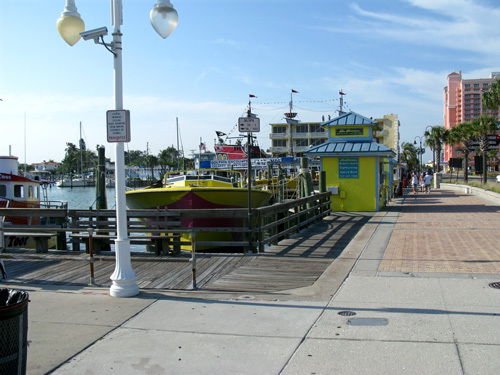 In order to get to breakfast at Crabby's, we had to turn left at the end of the little bridge, and pedal through the Clearwater Municipal Marina parking lot. If you decide to bike through here, keep your eye out for big delivery trucks early in the morning. 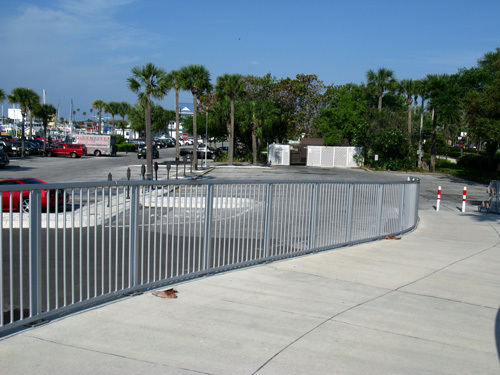 The marina parking lot will bring you right out to busy Coronado Avenue. 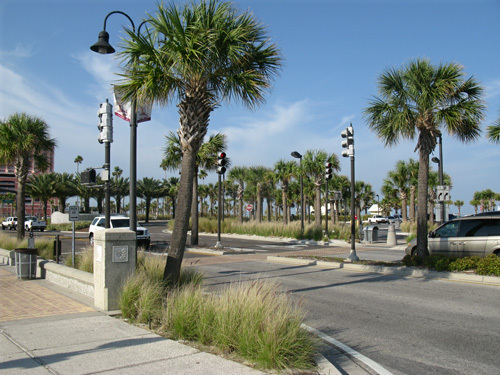 Looking to our left, we could still see the huge Clearwater Beach Hyatt Regency Resort. Now all we had to do was find a crosswalk to get over Coronado to the Beachwalk. Fortunately, there was a crosswalk with a signal directly to our left. 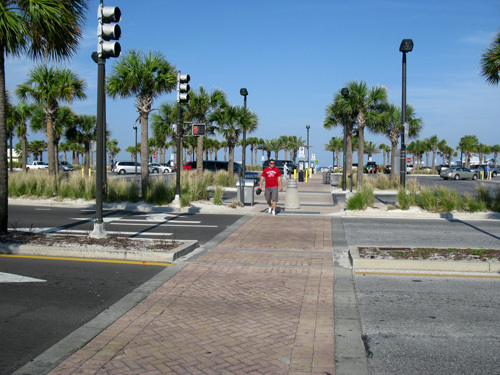 It would take us right to the wide Beachwalk sidewalk that heads down Gulfview Blvd. 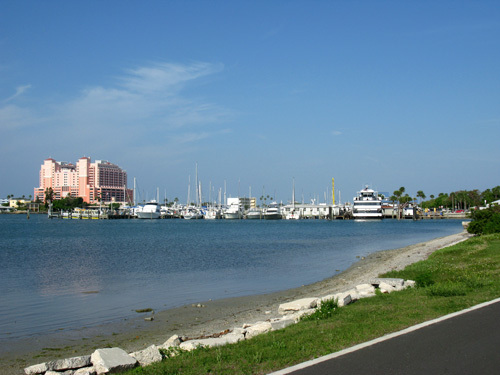 Even something simple as riding to breakfast at Crabby's makes us thankful we live here in Paradise. The Florida beach lifestyle is something we do not take for granted. We have always been grateful that we can be out here each morning. As luck would have it, there was a bike rack right across from Crabby's. We definitely knew we made it. Our ride to breakfast at Crabby's only took about 15 minutes. A menu was right next to the big sign. It may not be real varied, but the prices are good and it had what we were looking for. 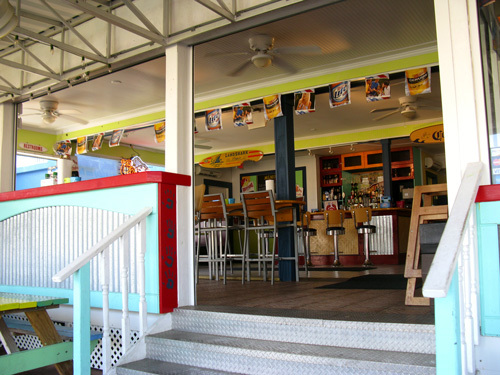 Previously, when we'd eaten dinner here, we sat upstairs, but that area is not open for breakfast at Crabby's. 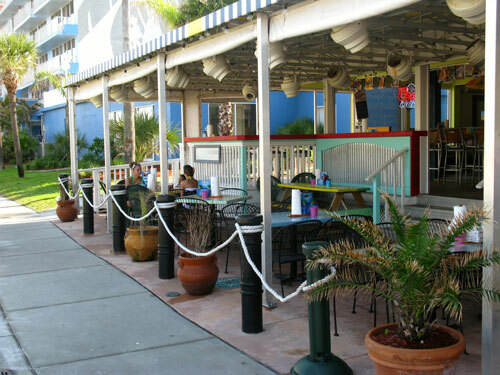 The outside seating right on the Beachwalk was perfect, though. 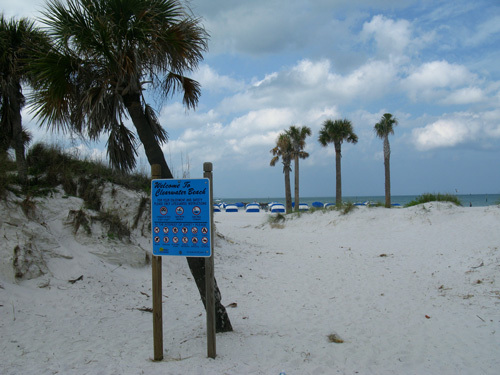 We had early morning sunshine, a cool breeze off the Gulf, and just a hint of saltwater in the clean Florida beach air. Inside seating is open and airy if you don't want to be right out in the elements. 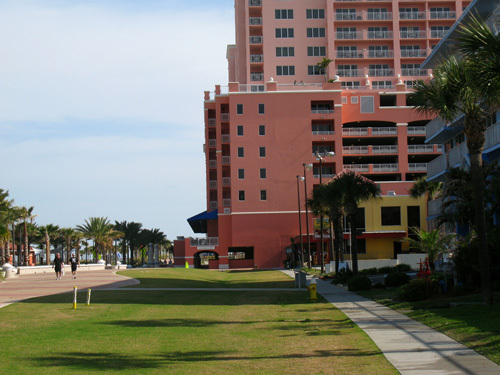 You can step right off the patio and look north to the Clearwater Beach Hyatt Regency Resort. 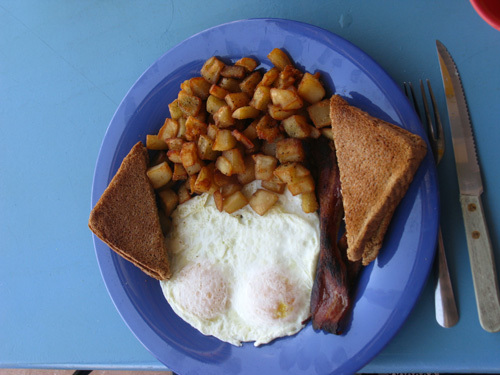 My girlfriend ordered two eggs over easy and the home fried potatoes. 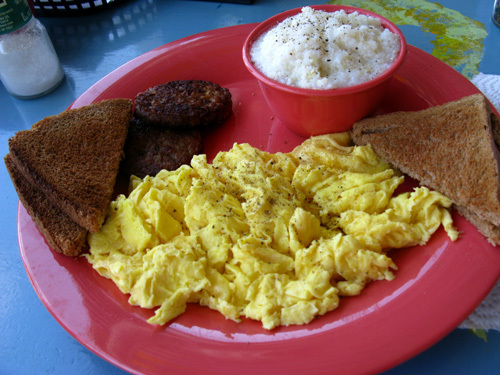 My breakfast at Crabby's was the usual two scrambled eggs, wheat toast, and grits. A side of "breakfast meat" is also inclded in each order. When we come back in a few weeks, we'll get the Build-Your-Own-Omelet and split it. 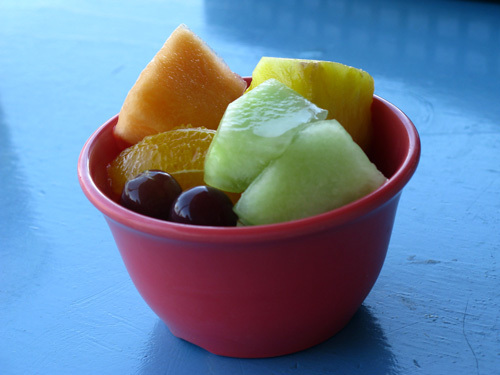 For only 99 cents, we got a good-sized fruit bowl with cantaloupe, pineapple, honeydew melon, grapes, and orange wedges. 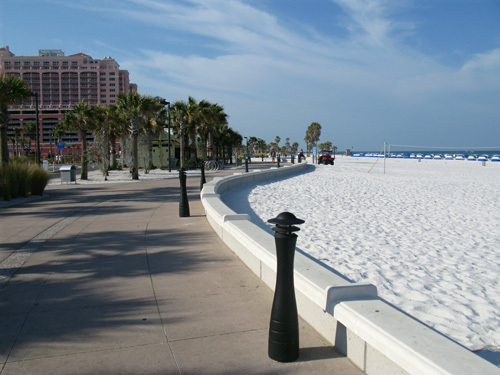 We took a walk on one of the beautiful Clearwater Florida Beaches (South Beach) after such a filling breakfast. We rode our bikes back to the truck and took a nice walk to the top of the Memorial Highway Bridge. It gave us a beautiful view of Clearwater Pass. Our ride to breakfast at Crabby's could not have ended more perfectly.